This might seem like a strange thing to include in my blog. And you would be correct in assuming that I don’t generally eat pickled condiments with my meals. I am am posting this recipe as a pre-cursor to my next post which will be about sandwiches. Not just any sandwiches though….Banh Mi. Banh Mi are those delicous rolls with chicken or pork and fresh salad that you can get at many Vietnamese bakeries. So…..to make these sandwiches at home, you need some pickled carrots or it just isn’t anywhere near as good. Here is a recipe I have used, and it works fine. Mix the ingredients in the hot water to dissolve sugar and salt. Pour over carrot in a glass container. 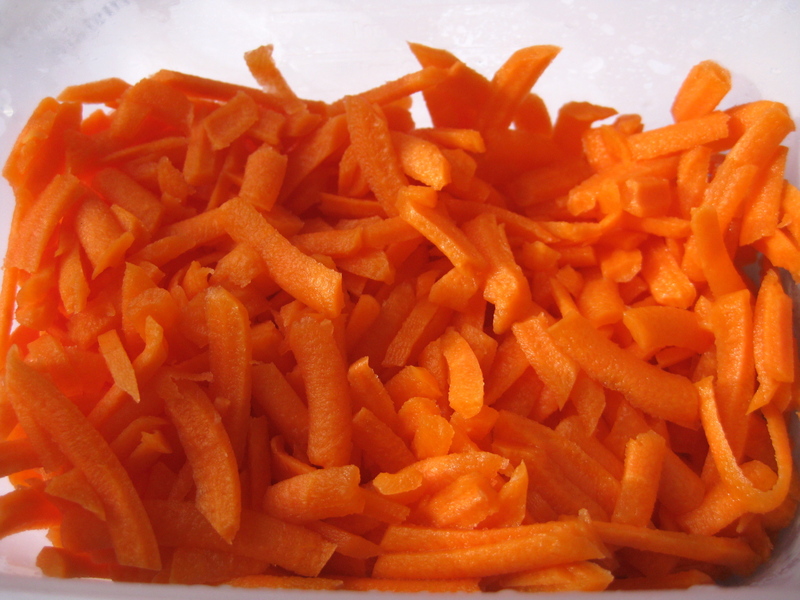 Best to use a food processor fitting to get the right thickness for your carrot, or it could end up too fine. You could always julienne or use a peeler to create long, thin stripes (perfect for sandwiches). You can alter this recipe to suit your taste…in particular the sugar and salt. I found the need to rinse the carrot with water before use, otherwise it’s a little strong.